This looks rough. Its wheels are half buried in the ground. 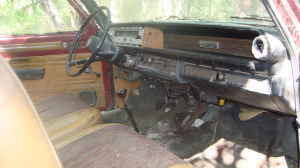 As soon as I saw the picture of the interior, I could smell the mildew. It's been sitting outside in Alaska, a state not known for its warm, dry climate. There is no mention of when it last ran or if it runs at all. Logic would say that this is a parts car. However, in order for a car to be a parts car, you have to have another car for the parts to go on. 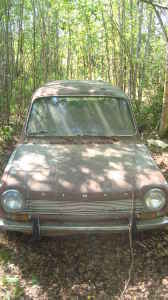 What are the chances that there is another Simca 1204 in Alaska? Might as well restore this one and make it the one and only driver in the state... How's that for logic? I'm a sucker for cars like this. There can't be many 1204 2 door wagons left in North America. I hope someone in Alaska decides to spend the long winter in his or her garage restoring this one. Located in Big Lake, Alaska, click here to see the eBay listing. 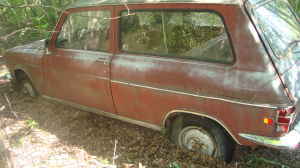 The 2 door wagon version of this series is quite rare. Most were 4 doors. This is the first time I've ever seen one! It's kind of like a Chevy Nomad. In France 2 door wagons were usually classified as being commercial vehicles for small enterprises. They got a tax break (no joke intended) as a result. On the other hand, the rear portion of such vehicles is usually metal, like on a delivery van. What strikes me as odd is that the 1204 was for export, so the French tax incentive really would not apply. This is a head scratcher! This is a 1969, because the 2-door wagon was only offered in the US in 1969 and after 1969, the individual letters, S I M C A on the hood were replaced by a SIMCA emblem. It was not all that unusual to see 2-door wagons in those days. All Opel Kadetts were 2-door wagons, as well as the VW Squareback and future Fiat 128. The Pinto and Vega were 2-door wagons as well. Simca probably dropped it after 1969 in the US because they may have sold three altogether, and the 5-door version made so much more sense. Plus, you could only get the 2-door as an LS, not with the GLS comforts. Howdy...What happened to the car? Did someone rescue/restore it?